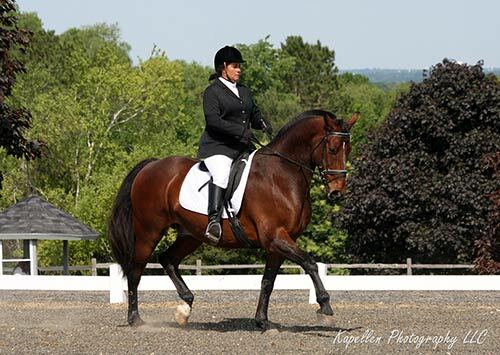 We want to congratulation Barb Pendleton and her beautiful Flying W Farms Prince Sultani; Like many of our clients, Barb is a dedicated amateur owner/trainer rider of her own horse. This email speaks to the fact that hard work and patience always brings great rewards! 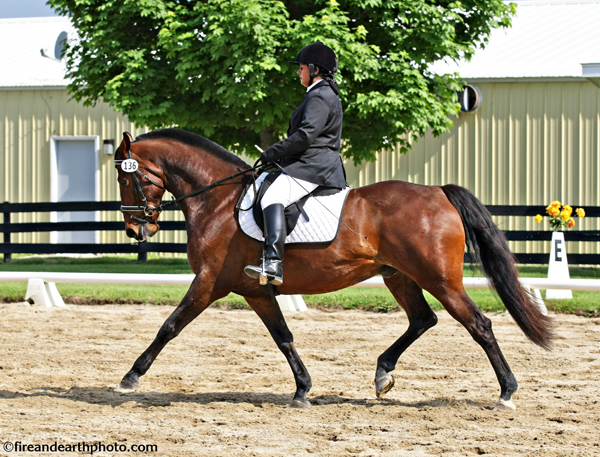 We are very proud of both Barb and Sultani; We look forward to their 2013 show season at Fourth Level! Many Congratulations and best wishes to both of them! All of us at Flying W Farms. Just an update on Prince Sultani #247. We, as in mostly me, have been struggling with flying changes for a year or so now. But I did decide we should go out to some shows this year and try out what we had so far at Third Level under pressure. A bit tense at the beginning. Our scores started out in the 50% range. We struggled on and at the end of the year finally had two relaxed tests and scored a 62% at Third Level 1 and then a 69% at Third Level 3 with 2 clean changes. So we are on our way up. And with a lot of work this winter we will be heading for Fourth Level next year. I can't tell you what a joy Sully is to work and be with. His clowning attitude and desire to please is the highlight of my day. We look forward to the upcoming year. I attached some of our photos from this years showing. After a year of struggling with flying changes I think we are finally starting to catch on. Flying Changes were new to both of us. Sully at first thought I was trying to make him do the impossible and I found out I wasn't as coordinated as I thought I was. Towards the end of the summer We attempted Third Level testing out or Changes under pressure. With a 50/50 chance of change, along with many other rider errors we still managed to squeak out a 60% giving me the final score needed for our Bronze medal. Just thought I would send awesome picture snapped of Prince Sultani strutting his stuff. 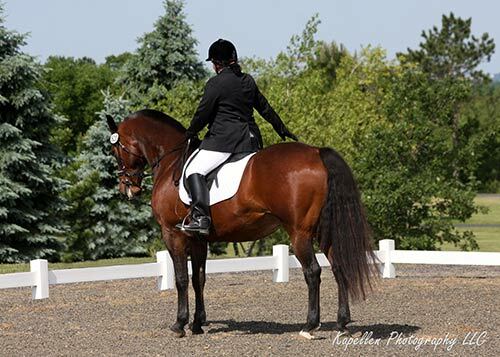 He is out of Flying W Farms Sultani Blue (Saddlebred/Shire) and by Koning (Friesian). 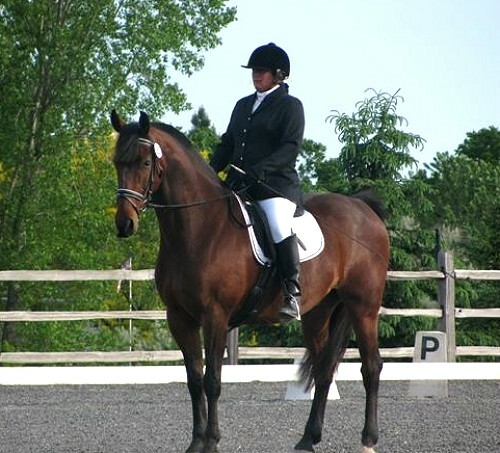 In 2008, Sully's first year of showing, we showed in Training level ending the year scoring in the 70s. He took third in WDCTA with an average of 69%. Sully was born to show. While in the ring he is very serious and attentive to his work. Back in the stall he is a goof. Last show I had quite a few people tell me how they would walk by his stall and he would reach out to grab their sleeve with his lips. Then point his nose down at the bag of treats which were out of his reach. I came back later to find half of his treats gone. He had conned quite a few people into giving him one. This year his work had improved so much I jumped him a level up to second level. Riding even the hardest test. We both like a challange. By the third show we are scoring in the mid 60's. By the end of the year I can see us only improving. I will keep you posted.